The first direct connection between power markets in Germany and Norway. NordLink, the ,green link’, is the first direct power connection between Germany and Norway. The high-voltage DC link will enable the exchange of 1,400 megawatts of renewable energy – wind power from Germany and hydropower from Norway. NordLink is thus making a decisive contribution to the energy transition in Germany and Europe. The exchange of energy via NordLink will increase security of supply for both the German and Norwegian electricity grids and will enable the exchange of renewable energy, in particular hydropower and wind energy, between the two countries. This will not just have a positive effect on energy prices, but will also push the integration of the European power markets further forward. NordLink is being implemented as a high voltage direct current (HVDC) transmission between Germany and Norway with a route length of 623 km. Due to its length, direct current will be used to transmit the electricity through both cables (positive and negative poles), which are connected to converter stations at each end. Direct current is especially advisable over long distances and for large-scale transmissions of power. The converter stations will be built in Wilster, Schleswig-Holstein/Germany, and Tonstad in Norway. At these sites, the electricity is converted from direct (DC) to alternating current (AC) - or vice versa, depending on the direction of transmission - and fed into the German or Norwegian transmission grid in order to supply households and companies with electricity. NordLink is a milestone in the realisation of the energy transition. With the incorporation of the project into the Federal Requirements Plan Act, the necessity and urgent need for the implementation of the project for the energy market has been established by law. The conferral of the status of ,Project of Common Interest’ by the European Union, in accordance with the new guidelines for trans-European energy infrastructure, underlines the high economic and energy-economical importance of the project at European level. NordLink – the ,green link’ – creates a connection to the capacities of hydropower plants in Norway and will counteract bottlenecks in the German transmission grid. This interconnector increases facilities for the exchange of renewable energy and plays its part in the reduction of carbon emissions and achievement of climatic objectives. NordLink has a capacity of 1,400 megawatts (MW) and can supply more than 3.6 million German households with renewable energy. This is equivalent to the same feed-in power as would be produced by 466 wind turbines at 3 MW each. This means that the capacity of the interconnector is slightly higher than that of a large conventional power station. 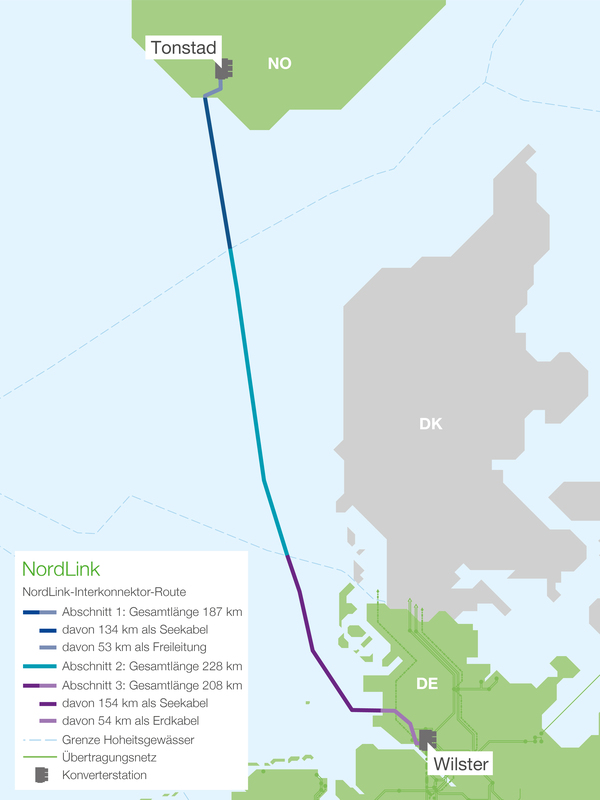 NordLink is the first interconnector to provide a direct link between the Norwegian and German energy markets. This connection promotes the integration of the North-western European energy market, increases market efficiency and contributes to a stabilisation of energy prices. Connecting Norwegian hydropower with German wind power provides benefits for both countries. Whenever a surplus of wind energy is produced in Germany, for example, it can be transmitted via NordLink to Norway. The reservoirs in Norway then serve as natural storage for wind energy as the water remains in the reservoirs. Conversely, Germany can import hydropower from Norway when demand is high. The NordLink project will be implemented by the Norwegian TSO Statnett and DC Nordseekabel GmbH & Co. KG, each with 50% ownership. TenneT and KfW each have a 50% share in DC Nordseekabel. DC Nordseekabel is responsible for the construction and approvals on the German part of the project. NordLink will have a capacity of 1,400 MW (high-voltage direct current transmission) and will run between Tonstad in Norway and Wilster in Schleswig-Holstein/Germany. TenneT and Energinet.dk – the operators of the Dutch and Danish high-voltage electricity grids – are installing a high-voltage direct current submarine cable that will interconnect the electricity grids of the two countries.